This is an article we love to share at New Year resolution time as it quite simply presents the most important aspects of the NY resolutions dilemma. it was published for CanFitPro, a leader in fitness and wellness education in Canada, in both their Consumer and Fitness Professional newsletterBy: Lynn Petruskavich ● B. Kinesiology ● Fitness Trainer, Trainer of Trainers and Leader for the past 15 years. A strange paradox struck me the other day. We know more about exercise than we’ve every known. We have better equipment, training modalities and trainers. We have gadgets to count heart beats, calories, RPM’s and steps. And yet, inactivity is still on the rise – with more than 50% of Canadians (no difference in Australia) still considered inactive. More kids are obese. More people with diabetes, cancer, heart disease and other diet and exercise related illnesses. It just doesn’t seem to make sense, unless… you consider for a moment that motivation and mindset just might be a larger factor. At first glance some people seem to just have an abundance of motivation (picture Lance Armstrong) while others just don’t (picture your friendly neighbourhood couch potato). A friend of mine gets up at 5:30am daily for her morning run while other people I know drop on and off fitness programs like the changing of the seasons. What makes one person able to stick with a regular exercise program and others, not? Even though we know how to train the body to achieve results, we really haven’t given a lot of attention to how to train the mind to support exercise success. Sports Psychologist, Gary Mack, in his book Mind Gym: An Athlete’s Guide to Inner Excellence (I highly recommend this book) explores the mindset that is necessary to build “mental muscle” just like building “physical muscle”. Working with hundreds of professional athletes, Mack has observed that one key to achieving success “is to learn how to focus on the task and not let negative thoughts intrude”. So, perhaps my runner friend has just learned how to talk back to the voice in her head that says “it’s too early/cold/dark to run this morning…” while the others succumb to the voice that says “I don’t have enough time/energy/desire to do this workout”. What struck me about Mack’s account of these high level athletes is that EVERYONE experiences a “mind game” of sorts. We all have moments where we think we are “too tired/short on time/short on cash” to invest in our health. Even myself, having exercised for the vast majority of my adult life, will still get hit with “I don’t feel like it” thinking. The difference is that I’ve been exercising long enough to know that my thinking is flawed; that while I may not “feel like doing it now”, if I just press on and do it, I will reap the rewards. While motivation is arguably self-directed, we can help it along by teaching our brain the desired mindset. Here are a few tips taken from the world of Sports Psychology to create the most effective mind set to support exercise success. If these techniques can work for professional athletes, I vote we all give them a try! • Make a mental commitment – decide on a fitness related goal and mentally commit. Write it down. Remind yourself often. Decide then and there that you will honour this commitment – even when you don’t feel like it – because you know it is the right thing to do. • Create a mental catch phrase or word that you can consciously say to yourself when your mind tries to sabotage your exercise intentions. For example: If you start thinking “I’m too tired, I think I’ll skip this workout”, then recognize the negative thought and immediately counter it with a catch phrase like “I can. I will!” Consciously turn “off” your thinking and just go do it! 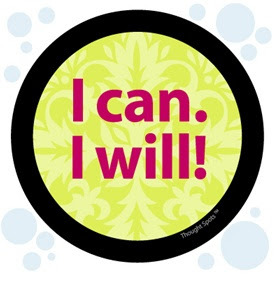 Write your catch phrase on a sticky note or use a Thought Spots message on your mirror or waterbottle. • Practice mental rehearsal and mental imagery. Picture yourself doing the exercise, following through on the commitment, overcoming set backs, and achieving success with your fitness goals. • Build a mentally tough attitude. Perspective is everything – look at the exercise goal as a challenge to rise up to as opposed to a threat to beat. Every action you take to move towards the goal is a good one. • Identify your self-defeating thoughts and behaviours in advance. Know your strengths and weaknesses. Decide how you will face them so that when they come – and they will come – you will feel confident and capable to overcome them. • Cultivate self discipline and believe in yourself. There’s a famous saying that goes “If you think you can - or can’t - you’re probably right.” Develop an ability to do what you have to do when you need to do it, whether you want to or not. Choose to believe in yourself with positive, “can-do” thinking. So, when you’re planning your fitness program, take some time to think about your mindset so that you can increase your chances of success. Making exercise a lifestyle habit takes commitment – both physically and mentally. Decide now that you can…you will!